Ghent, New York, June 6th, 2017 – Awingu, a provider of online unified workspace solution, today announced it is named a Cool Vendor by Gartner in their ‘Cool Vendors Unified Workspaces, 2017’ report. “We are extremely honored with our recognition as Cool Vendor in Unified Workspaces by Gartner. Businesses increasingly need to adopt a ‘platform agnostic’ workplace strategy. 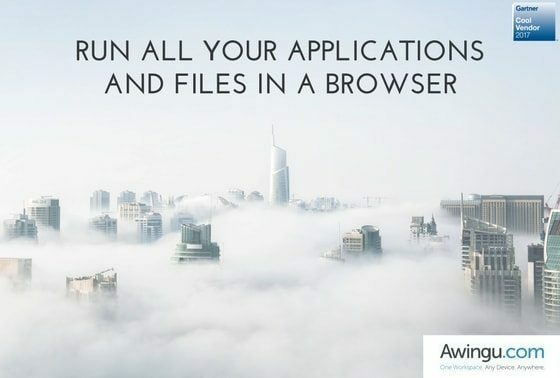 Awingu offers an immediate and cost-effective solution that is not only platform agnostic but also secure and mobile. We are excited to see analyst firm Gartner acknowledge us as a Cool Vendor” says Walter Van Uytven, CEO Awingu. Gartner’s “Cool Vendors in Unified Workspaces, 2017” report was published on May 25th, 2017. The report was written by analysts Michael Sliver, et al. The report is available for Gartner customers right here.